The alarm went off at 6am, and like all mornings over the past three weeks, the first 15 minutes were spent hobbling around the house with intense heel pain. But today was going to be different. Today was my 29th race of the year. Today was going to seal my NSRRA Compleat status. And having mentally prepared all week for pulling off something special at my inaugural Flying Fox 10, this pain wasn’t going to stop me. 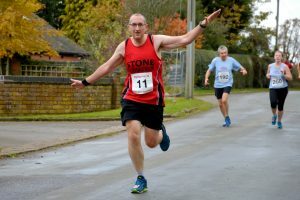 After finishing my habitual pre-race sustenance, a hot teacake loaded with peanut butter, I donned my SMM vest with pride, and took to the roads for the short drive to Standon. On arrival, I was directed down to the non-VIP car park by fellow bat and NSRRA Group F competitor, Richard Shaw. There were already many bats walking up the road or directing traffic, and bats supporting & cheering on every corner was a theme throughout the race. Remarkably it was also a positively balmy morning, which as someone who detests cold & rain was extremely welcome. Having arrived at race HQ, picked up my number (who decided on Legs 11? ), it was straight outside for a quick photo shoot with my fellow Compleat runners – David Dunsmore, Bryan Powell & Alf Slater. Whilst I had several goals for 2018, Compleat didn’t really enter the possibilities until late in May. It silently snuck up on me and before I realised what was happening, it was too late and the NSRRA addiction had well and truly sunk in. My congratulations to all the Compleat runners, inclusive of Colin Pheasant who surely would have been alongside us if possible. Following a brief warm up, it was time to get into position; no longer starting innocuously towards the back, but jostling myself forward to gain a vital few extra seconds advantage. 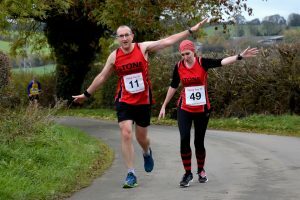 All pre-race fears – yes, I still have many – had now abated and after a brief delay for an impatient car, the starting pistol was fired and away I went. The first half mile was simply a game of getting past as many people as possible in a lane that was tight at four runners abreast, but I took advantage as each small gap opened up. A quick look at my watch showed a 9:00m/mile pace, a fair bit off my target for today, but I was feeling good – really good – and was confident I could pick that pace up now the runners were thinning out. I had latched onto my fellow group F competitor, Peter Williams, running about 50 yards behind and matching his pace. Peter vanishing off into the distance has been a familiar sight during 2018, and I congratulate him on a superb year. Alongside Peter was Laura Slack, seemingly running effortlessly as always. Flying Fox 10 promised a scenic route and it was delivering a great countryside run. The first 2 miles go by and we’re heading back down Mill Lane towards Standon. I’m still feeling good, barely any pain in my heel, legs feeling strong and mentally in the zone. Running towards the crossroads, I can hear my name being shouted by several people – I didn’t look to see who – and as always it’s those simply shouts of encouragement that makes you pick your legs up just that little bit higher, to raise your head & straighten your back and to refocus on the task ahead. I don’t think we’re allowed to call a course hilly, unless it’s Meerbrook. More than a couple of people had warned me Flying Fox 10 was “undulating” with an incline at mile 6, so the two miles leading up to this was purely about pushing as hard as possible and hoping I could make it up the slope ahead. I was still behind Peter, but now beginning to drop a little distance. Laura had noticed me behind her and dropped her pace to keep with me. During this couple of miles we passed Pam & Mac who were marshalling on one of the railway bridges. I can’t remember the exact comment, but Pam expressed true surprise at how well I was doing, and it was at that point I realised I was, so far, having my race of the year! Then mile 6! Truly it didn’t feel that bad. I certainly lost pace, but Laura stuck by me offering encouragement and in the true spirit of the NSRRA, other close by runners also coached me up to that summit. I believe it was around this time I was caught by another bat running well, Bonnie, and we had a brief exchange of places – my legs serving me well down hill – before she gradually pulled away. The next couple of miles were eventful. I was tired, shoulders & back aching and breathing hard, but still felt stronger in the legs than I have in any previous race. Despite the pains, I was really enjoying this. I reached the 9 mile sign, not far now and time to see what was left in the tank. I was passed by a group C runner and decided this was the time to really dig deep. With shouts & screams of encouragement from Laura, off I went and pushed ahead in pursuit of Mr. Group C. I knew I wasn’t going to beat him, but now it was purely about pacing off him for a better time. 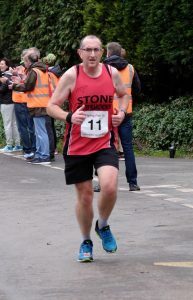 As I ran down Church Lane towards the finish, I could again hear my name being shouted by several people, but I was now far too focused on getting to that line to recognise the voices dragging me to the finish. My legs hadn’t failed me and were still going strong, despite the rest of my body wondering when on earth the suffering would end. One final left, a short sprint and there was the finish. After the obligatory priority of stopping Strava, I was instantly congratulated by many bats and other competitors with nothing but positive comments, and informed my time was just over 1:24. I had achieved another huge personal best, beating Rugeley 10K by a whopping 13 minutes and I’d finished the Flying Fox 10 with a 3rd place in my group. 2018 NSRRA was over and I was a Compleat runner. Yet 12 months ago, I was a distinctly average runner. I was in my first year as a runner and as a bat, and whilst I had improved over the year, I had no targets or focus. Then I read an NSRRA race report by David Dunsmore, someone I only knew as one of the “quick ones” in the SMM. That report set in motion the changes in my life that have defined my 2018. This year has been tough, but I’ve discovered that by combining goals with determination and support, the unimaginable doesn’t take that long to start achieving. I’ve discovered competitiveness at a point in my life when I didn’t expect to have anything I could achieve. I’ve discovered pain that I didn’t think existed, but that you can work around and through it with the right guidance. Being part of SMM & NSRRA has brought me new friends of all ages, paces & abilities, and the “quick ones” are just as supportive and approachable as anyone. 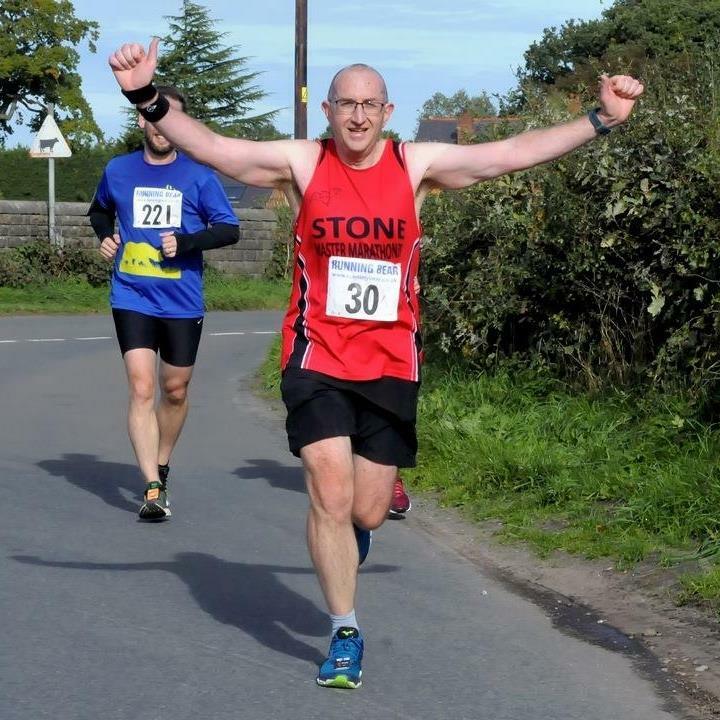 Being part of the incredible SMM family has helped me overcome major running anxieties (I came close to fainting at the start of Stafford Half 2017!) and has driven me to PB after PB. I’ll remember 2018 as the year I stopped being a jogger and became a runner. I’m already planning to stretch my goals & challenges for 2019, and if this article encourages just one person to do the same with their running journey it would be the proudest achievement of my year.